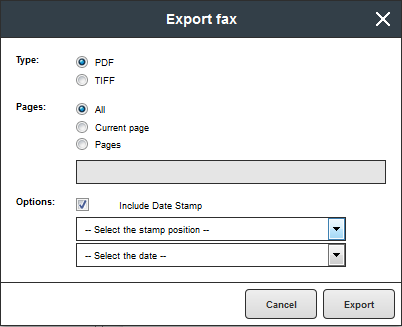 In order to export a file from SFax, first browse to the folder containing the file and select it (either individually by clicking on the document, or multiple by using the checkboxes). 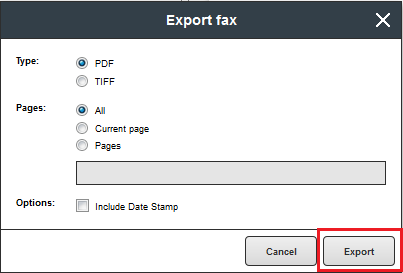 After you have selected the fax/faxes you wish to export, press the Export button. 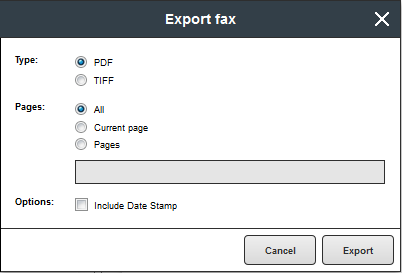 This will open the Export options window, which will allow you to select file format (PDF or TIFF), the pages you wish to export (All, Current [displayed], or Pages [choose the pages like when printing from other programs]) and whether you would like to include a Date Stamp on the exported document. 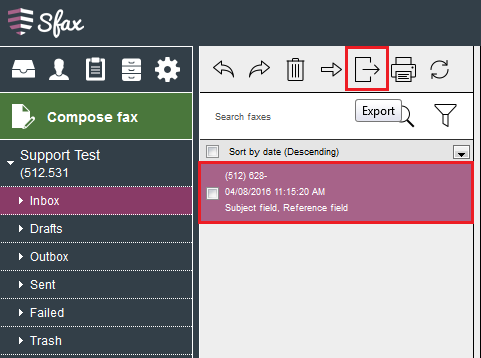 If you choose to add a Date Stamp, you can then choose the position and date from the drop down menus. After which you will receive a prompt to save, or the file will download to your default directory (depending on the browser you are using).